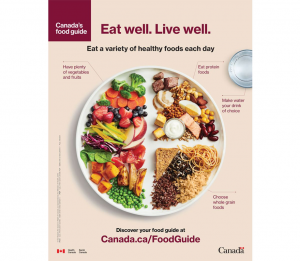 On January 22, 2019 the Government of Canada released an overhauled version of the iconic Canada’s Food Guide . The new guide does away with confusing prescriptive serving sizes and the cheesy (pun definitely intended) rainbow background. The new, simplified version, encourages plant-based eating and reduces the emphasis on meat and dairy (actually the dairy category was eliminated altogether) and focuses on portion sizes. The guide highlights water as “your drink of choice” and discourages consumption of sugary drinks (juice, pop) and alcohol. Also, notable, the new guide emphasizes food behaviours to promote healthy eating habits; encouraging Canadian’s to “be mindful of [their]eating habits” and promoting home cooking, enjoying food and eating with others. The new guide is not without push back. The shift away from meat and dairy has resulted in opposition from the respective industries. Earlier in January, Tom Lynch-Stauton, a representative for the Alberta Beef Producers, told The Globe in Mail that it would be dangerous to equate meat with plant-based proteins. Similarly, Isabelle Neiderer, director of nutrition and research at Dairy Farmers of Canada said that eliminating the dairy category “sends the wrong message that foods are interchangeable.” The criticism predominantly comes from corporations that have financial bias, and would benefit from having their products highlighted in the national strategy. Dieticians of Canada and the evidence laid out on the Government of Canada supports the Food Guide’s changes. As a basic education tool, the Food Guide is designed to help Canadian’s follow a healthy diet. Additionally, it largely influences public institutions (i.e., schools and hospitals) in shaping their meal plans. There lies its importance; the Food Guide influences the individual health and well-being of Canadians, affects health care costs and impacts climate change. It is time to eat more plants! A plant-based diet has been shown to lower your risk for obesity, colon cancer, cardiovascular disease and type II diabetes. On a system level, diet-related diseases in Canada are estimated to cost over $26 billion dollars per year . Although I acknowledge these plant-based benefits, I am going to focus this opinion piece on the impact on climate change. It is an interesting paradox – we grow plants to feed animals, which require all of the resources (land, water, fossil fuels, pesticides, fertilizer to grow). Then we go ahead and feed the plants to animals and “care” (that’s an opinion piece for another day) for them over their lifetime while they produce methane and manure. Have I convinced you to eat plant-based yet? There is another option… a diet to save the world, you could say. “Flexitarian,” a healthy compromise for you and the planet. This lifestyle is predominantly plant-based, it includes eating plenty of fruits, veggies and plant-based proteins (aligning with the Canada Food Guide), as well as modest amounts of poultry, fish, milk and eggs, and minimal red meat. It is the least restrictive approach that is both healthy for Canadians and would reduce greenhouse gas emissions enough for us to stay within environmental limits. I encourage you to start thinking about red meat as you do lobster, a ‘special occasion, once in a while’ kinda food. As a beginning ‘flexitarians’ try to eat six to eight meatless meals per week. At a more advanced stage, try to eat at least 15 meatless meals per week. It is worth noting that a vegetarian or vegan lifestyle would result in even lower greenhouse gas emissions. Plant-based protein options include tofu, tempeh, edamame, lentils, chickpeas, nuts, quinoa etc. With a bit of effort, and the power of the internet, you can find yummy, healthy plant-based recipes. I hope that this opinion piece has provided you with some insight and motivation to make lifestyle changes that will benefit your health as well as the environment. The Buddhist Chef: – Check out the Thai red curry ramen or the vegan mushroom pie! Happy Cow: – This website is an inventory for vegetarian and vegan restaurants worldwide! Kate Aben is a pro-choice, mental health advocate; a liberal-voting feminist who believes the earth is round. She works as an Occupational Therapist in Forensic Mental Health and reads cookbooks for fun. 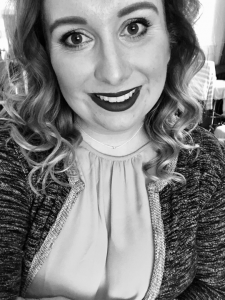 Kate grew up in and loves Huntsville; the lakes and the snow! Diet for a New America is a 1987 bestselling book by John Robbins. The book discusses vegetarianism, the environmental impact of factory farming and animal rights. My first book and haven’t looked back since. Thank you, Kate, for sharing this important information with our community! Clear evidence has been surfacing for decades now that regular meat consumption is unhealthy, expensive and unsustainable. A more plant based diet is healthier, less expensive and much more easily available to people around the world. It is the way of the future. It would be wonderful to have a vegetarian restaurant as an option in Muskoka. We sure could use a place that’s open all year! Hi Tom! I am the owner of Soul Sistas Restaurant, here in Huntsville, which is vegan and vegetarian! Come in and see us! We do offer some meat protein options (the demand is still there) but most of what we offer leans towards healthier, vegetarian, gluten free options. Hope to see you soon! And the food at Soul Sista’s is awesome….I recommend it highly. While it is definitely a good idea to eat MORE plant foods, I have to disagree that veganism (a plants-only diet) is a healthy choice. There has never been a people group anywhere who have eaten only plants as their standard diet (and survived). There is a reason for that. Vegan diets are not healthy diets–they are typically deficient in a number of nutrients–iron, B12, protein, essential fatty acids, etc. Veganism is especially unhealthy for men (because of their large muscle mass) and children (because they are growing rapidly). Unless a rather large amount of carefully balanced plant proteins are eaten, the diet will not supply enough protein to preserve muscle mass and foster growth. On the other hand, ovo-lacto vegetarianism (where eggs and dairy are eaten), can provide all essential nutrients (a generous supply of eggs provide the necessary iron). As an example, Hindus in India eat no meat but they eat a lot of eggs and dairy products–some even eat fish. The addition of fish protein makes the diet even healthier except for the problem of finding fish from non-polluted water. In much of the world, an ovo-lacto vegetarian diet is standard, with the possibility that men and children will eat small amounts of meat as a supplement. The swollen bellies and bony arms and legs of starving children in Africa are the most obvious presentation of a disease called Kwashiorkor–a disease caused by the severe lack of protein in the diet (as opposed to marasmus which is caused by absolute starvation). It isn’t that the Kwashiorkor victims lack plants–they typically have plants to eat (sweet potatoes, yams, greens, various wild-harvested plants, etc.). The disease is the result of the children having virtually no source of high-quality protein in their diet. Meat, milk, eggs and fish provide high quality protein. Your thinking goes so far from the Science it is laughable ..You must be reading your old encyclopedias from 1935 and even then the science showed eating red meat would lead to heart health issues and vascular disease…Update Erin…The North American diet is the most unhealthy in the World based on excessive amounts of fat from dairy and meat/fish consumption.Factory farms produce double the greenhouse gas that carbon based products do ( notice I said Factory Farms not Family Farms )…..The biggest thing missing from North American Diet is FIBRE not Protein…Approximately 15 to 20 % of Canadians get enough fibre and the majority get far more protein than daily recommended needs especially plant based eaters…..Get your head out of the milk can and read the Science and not the propaganda from meat and dairy lobbies who by the way we’re not invited to give their opinion on the new Food Guide…..Coincidence….I think not. I doubt very much that the Cleveland Clinic article was written by someone who is a shill for the meat and dairy industries. The article tells us that our BODIES produce more cholesterol in a day than we could possibly eat. We actually eat less animal fat than our ancestors did and yet heart disease, as a cause of death, continues to grow. The problem likely stems from certain metabolites, like C-Reactive protein and there is a probable genetic component to the fact that the bodies of some individuals manufacture much more of this substance than do the bodies of others. We now know that stress could be factor in the production of inflammatory cytokines, such as C-reactive protein, in the body. Measuring C-reactive protein is a much better indicator of incipient CVD (cardio vascular disease) than is the measurement of cholesterol. Now, I do agree with you that SOME people eat TOO MUCH protein and, through the over-stimulation of mTOR pathway, is one probable cause of cancer. But there is nothing wrong with eating red meat IN MODERATION. It is a source of vital nutrients. Our standard N. American diet IS probably a bit meat-heavy and plant-light. That much is true. But, human beings are omnivores–not herbivores. The healthiest people groups (the most disease-free into very old age) eat a wide variety of foods, including animal protein and fat. It is important to acknowledge that I did not suggestion veganism in the article. I wanted to focus on a flexitarian option that is palpable for the intended audience. Additionally – although individual health was touched on briefly, I purposely choose to focus the main argument on climate change. This wasn’t call for veganism (although I am a strong supporter of the lifestyle) it was a call for less meat consumption by the general population in order to decrease our carbon footprint. I hope that is something we all agree on. I have some problems with some of your statements as well. Everything we eat has protein. Our Western culture is known for over-consuming protein on a regular basis. Increasingly, experts are moving away from meat and dairy consumption. The World Health Organization now categorizes meat as a carcinogen and as mentioned, the dairy category was removed from the Food Guide for having no nutritional value. When I say everything has protein I am not just referring to plant-based proteins, but also vegetables. An example – there are 6.4 grams of protein in beef per 100 calories and 11.1 grams of protein in broccoli per 100 calories! If you are concerned about the other vitamin/nutrients in meat, they can also be found in vegan diets. B12 does not come from animals, it comes from bacteria in soil. We feed b12 to animals in order to get the vitamin through the meat. Instead we could be getting in a plant based manner. Another common misconception is iron, but kale and broccoli have more iron than meat does. Omegas can be found in nuts and seaweed, rather than fish because fish also contain high concentrations of mercury and the other garbage that we dump in the oceans. Vegan diets have been approved by nutritionist for all ages and stages of pregnancy. It is unfair to express a blanket statement, ‘veganism is not a healthy choice’ like you did by comparing it to a disease that is only found in countries where there is famine. In my opinion, not an accurate comparison. Yes, Kate, I did not think that you were necessarily advocating a vegan diet but you have made it clear that you think it is a healthy choice. I do not believe that to be the case. 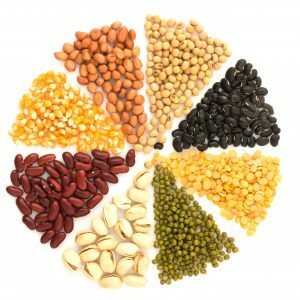 While it is true that all foods (yes, including all vegetables and grain) contain protein, it should be noted that most plant proteins are “incomplete”–that is, the amino acid profile is lacking in one or more of the nine essential amino acids (they are called “essential” because they are…well…essential). Plant foods would need to be combined with specific other plant foods which have amino acids that “complement” the amino acid profiles in other plant foods. Thus, we could pair grains with legumes (peanut butter sandwich anyone?) as each has amino acids that the other lacks. The problem with many vegans is that they just stop eating animal-sourced food and then they get sick because they do not understand about combining plant foods to get adequate amounts of protein. Meat, dairy, eggs, and fish provide COMPLETE proteins without even having to think about it. The calorie to protein measure is specious, in some degree, because we are not in the habit of eating a large enough serving of broccoli to get the same amount of protein that we would get in a hamburger. Meat provides a very compact package of protein. I would strongly disagree with the World Health Organization if, they said that dairy has no nutritional value. It is absurd on the face of it. Baby animals (including humans) subsist on milk of one sort or another for some months before parents gradually include other foods and diminish the role of dairy in their offspring’s diet. Some of the longest-living people groups eat yogurt or kefir every day. Around the world, fermented dairy is an especially important source of complete protein along with excellent supplies of beneficial bacteria (to offset the killing off of our internal biome by glyphosate residue present in more and more “Roundup-ready” foodstuffs). You need to understand that nutritional science has, of late, been politicized, like nearly every other kind of science. Climate Change as a result of the minuscule increase in CO2 is a hoax. While the planet may be warming (and I say MAY) it is unlikely to be the burning of fossil fuels that is causing it. CO2 is only about 4% of the atmosphere–not at all plausible that some tiny increase in it, is responsible for any large-scale effects. Dissenting climate scientists have said so but they get crowded out of the narrative by those carrying the banner of Anthropogenic Climate Change at the IPCC (only those who agreed with man-caused climate change were asked to participate). CO2 is “plant food”–I would think that “plant foodies” would favor even more CO2 in the atmosphere (we know that there were higher concentrations of CO2 in the atmosphere, during much of the past, because of ice core samples). Methane is a much more potent “greenhouse gas” but curbing it doesn’t have the potential for profiteering as does “limiting our carbon footprint”. Shouldn’t it make plant-foodies uncomfortable that the same people who are pushing the idea of man-caused global warming are the same people who brought us the “Oil-for-food” scam that was run through the U. N. a number of years ago? Contrary to what you have said, B12 is supplied by animal-sourced food. Very small amounts are gathered from plant-based food. We do not eat soil–and even if we did, our soils have been made sterile from all of the agricultural chemicals which we dump on them. I pointed out that children who contract Kwashiorkor have it as a result of inadequate protein intake caused by a plants-only diet. They are not necessarily victims of an absolute lack of food. Plants to not contain heme iron which is the most easy to absorb and it is supplied from meat, fish, and poultry. Children, who have an enhanced need for dietary iron for growth, need heme iron. If they are put on vegan diets, they will need to have their diets supplemented with a high-quality iron supplement. If you will note, I acknowledged the difficulty of finding un-contaminated fish. I take a molecularly-distilled and tested fish oil in order to get the benefits of eating fish without the PCBs and other contaminants. There are substances in fish which are not very available in plants (DHA and EPAs)–other than seaweed. Try convincing N. Americans to eat seaweed. Hi Erin- I am finding your comments very convoluted. I will keep my response short. Did you say that you do not believe in climate change? And that our climate is not significantly impacted by fossil fuels? If that is the case, to me, you’re responses no longer have any credibility and I will not continue to engage in this debate. For individuals interested in avoiding chronic diseases that are so dominant within our population I would steer them to Dr. Shane Williams, a cardiologist in Bracebridge. He works with some of the leading North American experts, practitioners and researchers in disease prevention and nutritional science. His practice is becoming increasingly well known in deminishing and eliminating diabetes, cardiovascular problems, improved mobility and mental clarity through nutrition. The emphasis in his program is focused on whole food plant based eating. Unlike most nutritional programs he stresses educating patients on the scientific link between what one eats and the specific impact that has on the body’s well being. Dr. Williams has a very caring and open approach in working with his patients and many of us are extremely thankful to have personally benefited from his care. Dr. Shane Williams is an advocate for Health throug Plant Based eating…..An absolute marvel at showing not only how to prevent disease but reverse it…I drank The Plant Based ” Koolaid ” 4 years ago and the taste gets better every day ! One additional benefit of this diet, not to be overlooked, is that the “global diet” would feed the estimated 11B people in the world in 2100; on the same land presently devoted to agriculture (an increase in efficiency of 300%). As I have often averred in this section, we need a Muskoka Food Charter (perhaps, initially skewed toward the “Flexitarian” (as per Kate and Erin; with allowances for change as new super-legumes are developed). Splicing, Monsanto-style, may become an instrument for good, not ill, in the future. The problem would be pure Economics 101: plants and berries etc. would rise exponentially in price; whereas beef, pork, poultry and fish should be expected to become less expensive. People would be tempted to return to the latter, poorer choices; and farmers would re-enter animal husbandry. The government would have to subsidize the healthier choices and even place tariffs on the less healthy. It’s all doable, but considering the government’s vulnerability to lobbying, and Canadians’ general preference for “laissez-faire” government; it could still be problematic. 1) It is extremely unlikely that the human population of the planet will ever get to 11 billion. World-class geneticists understand that “genetic entropy” is building up in the human genome (but they prefer not to talk about it) and that the many man-made chemicals in our environment, food and water are accelerating the rate of genetic mutation. From the study of extinct species, it has been determined that an approximate mutation accumulation of 3% starts a species on an extinction path. Over half of all plant species that ever existed are now extinct. Animal species seem to be a bit more resistant but there are already many animal species which have become extinct with many, many more which are genetically endangered. A book by geneticist, John Sanford, Ph.D. (inventor of the gene gun) explains the situation in terms that are accessible to the layman. It is called, “Genetic Entropy”. 2) The fact that animals are able to be grazed on marginal land that cannot be used for other types of agriculture (crops), throw doubt on your figures cited in support of the greater efficiency of a diet that excludes animal products. Monsanto is responsible for the wholesale poisoning of the planet with glyphosate (“Roundup”) which is a likely cancer-causer and is lethal to the beneficial bacteria in the gut. Nothing good is likely to ever come out of Monsanto. “Frankenfoods” and poisons are all that they have produced so far. 3)The hunter-gatherer diet has been shown to be a very healthy diet, when game and wild-harvested plants are easily obtainable. Archeologists who have studied ancient, hunter-gatherer burial grounds have always been startled to discover how few infant and child skeletons they found. Infant and child mortality skyrocketed with the wholesale introduction of grain into the diet during the neolithic period to the present. 4) There is the problem of plant lectins being very difficult for the human gut to digest–the amount of plant lectins vary from plant species to plant species but grains are among those plant species with the highest amount of lectins. Lectins are the plant’s defense against being eaten. Cooking and soaking grain destroys some of the lectins and fermentation is another way to destroy them. That is why our early neolithic ancestors (as opposed to paleolithic hunter-gatherers) struggled to find ways to make grains more digestible, such as the polishing of grain–but often it produced other problems. Polishing rice, for example, got rid of the less digestible rice bran, but the lack of B vitamins in the polished rice, produced a lethal disease called Beriberi. Certain Asian populations which used polished rice as the main component of the diet, succumbed to Beriberi in astounding numbers. My source for both the 11B-figure, and the 400% yield from the same land came from an interview on CBC Radio. I don’t generally listen for the specific source; but CBC is not Fox News. The various ills of Monsanto products are not news to anybody at this time: My phrase was “splicing, Monsanto-style”. I didn’t allude, nor would I ever believe that Monsanto would ever be a force for good in the future. I just feel that some of their methods, redirected in a positive direction, may prove helpful. I am not nearly as trusting in genome-tinkerers as you are, Rob. They tout their “successes” and simply don’t want to talk about their failures. Well i am personally going to say this , i would love to grow a vegetable garden in my yard but i have a black walnut in it which makes it very complicated to get things to grow without putting in raised beds and making sure the juglone cant get up to the soil im growing in. What i think this town could use perhaps is some of the town land being used as allotments, i realize there are a few at river mill park. But the few there are im sure could be enlarged upon. I know in England that allotments are almost a social gathering place with people who are just starting out getting help and suggestions from long time allotment people. This might also help with the lack of fresh veg for the food banks. I know the apple gathering in the fall at the end of the bike trail where the Johnsons once lived is very popular. Perhaps teach gardening at the public schools and the high schools also would be helpful. Anyway i know this probably is off topic but i think it would be nice for the town.